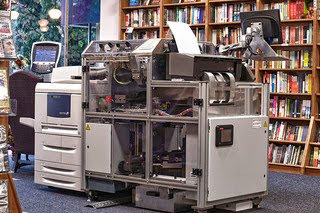 The Espresso Book machine allows bookstores and libraries to print books on demand in about 6 minutes. This allows independent authors to buy print copies of their books; something that has been a boon even to traditional authors wishing to emancipate their backlist and sell it themselves. The EBM [Espresso Book Machine] offers Bookshop customers instant access to over eight million titles that are written in a variety of languages. With the push of a button, any book from EspressNet(R), On Demand Books’ digital catalog of content, can be printed, bound and trimmed, creating a paperback book that is virtually indistinguishable from the publisher’s version. Patrons can also use the EBM to self-publish their own work on-site and will have the option to make their book available for sale through EBMs worldwide. Bookshop Santa Cruz is the first location in the Bay Area to have an EBM and one of only twelve bookstores nationwide to have one. Espresso Book Machine at Bookshop Santa Cruz from Vernon Alexander on Vimeo. How much do POD books cost? $18.50 for one copy of a book isn't too bad, but the writer would want to earn something on each sale, let's say 10%. 10% of $18.50 is $1.85, so the sale price would be $20.35. Before tax. This makes CreateSpace look attractive. If you go to this page and click the "Buying Copies" tab you'll be able to see how much you'd have to pay per book, as well as how much it would cost to ship your books. I've just taken out a Create Space account and, so far, the site seems very helpful. I've never seen an Espresso Book Machine, but I'd love to! It would be an amazing experiencing having a book printed right before my eyes. Thanks to Kim for sending me a link to the article, Self Publishing at Book Santa Cruz Using the Espresso Book Machine. Here is a link to a listing of all the Espresso Book Machines in the world! Thanks to Peter Smalley for the link.